This is one of our main objective: make the contribution to PrestaShop easier, keeping our quality standards high. Previously, we have described why we have introduced a pull request template and how Preston is able to validate it to help both contributors and maintainers. At PrestaShop, we also have commits naming convention that helps contributors to quickly figure out when a regression have been introduced and to generate changelogs. Since PrestonBot 1.0, there is a little bit more to help anyone with this (still) difficult subject. 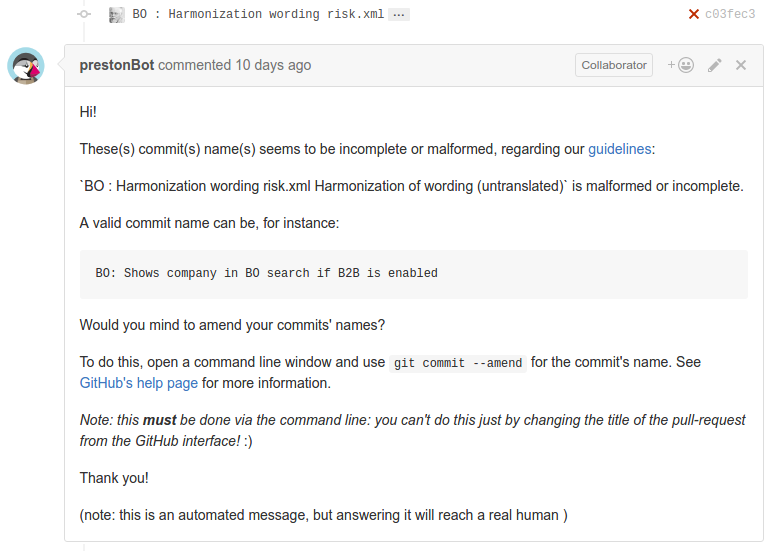 Regardless there is one or more invalid commits, PrestonBot will list them and provide you with an example of valid commit. When your commits are finally valid, the help message disappears like the one for the pull request description validation. If you have some ideas to improve the contribution workflow, don’t forget that PrestonBot is open source and available in the PrestaShop organization. Previously, we said that a lot of very different people are involved in PrestaShop: developers, but also testers, product managers and translators. PrestaShop wants to be available for everyone in the world, and even in the universe :) One of the most precious contributions to do that are the ones related to the translation and the content. For instance, thanks to many contributors PrestaShop 1.7 is already available in 25 languages, making the software usable mostly everywhere in the world! The process to get a translation key available from Crowdin - the platform that host translations for every language of PrestaShop - to the users is still a little bit complex and we are improving the way we want to deliver the translation packs. PrestaShop 1.7 introduced the “domainization” of translation keys. Using the new back office of translations, this make the work of traductors. We are also faster on delivering new versions of translation packs in both 1.6 and 1.7 versions. What happens every time a contributor wants to add or update a translation in PrestaShop? Most of the time, the update or the addition of a translation goes unnoticed by the team, often when happens in big contributions… until now. PrestonBot is able to analyze the contribution, and to add the Waiting for wording label when required. And @AlexEven only need to filter every contributions with the label, and to remove the label when the wording is valid. Usually, people are really afraid of contribute, because of the well-known “Impostor syndrome”. We - as a community - need to be friendly and kind, regarding the quality we expect from every contribution. We want a better environment to empower and encourage people to make their first contribution, because this is the most difficult one. This is why we have started to welcome community members in the core team, because we think everyone that want to be involved in this project is precious, and should be helped and thanked. In this case, the contribution of PrestonBot can help and the first use case we have adressed is to welcome every new contributor in our community. 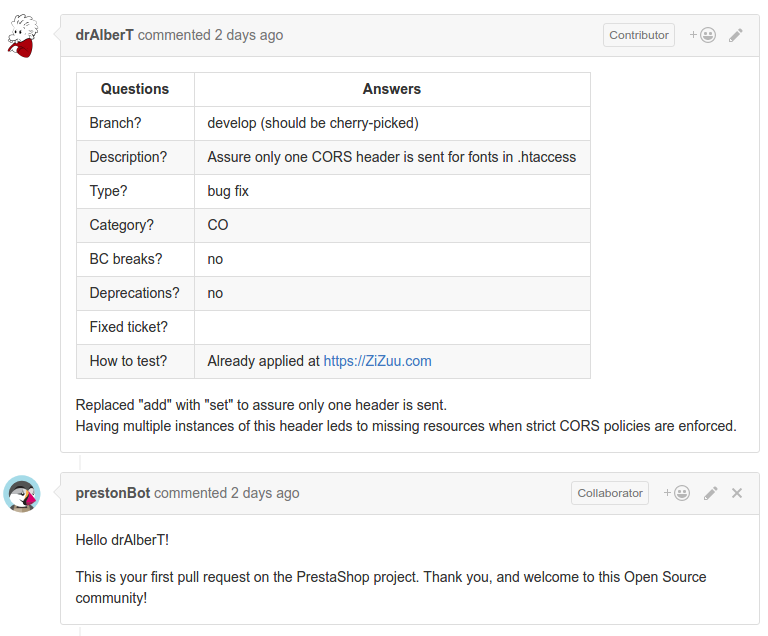 PrestaShop can’t really exists without the contributors. We are working hard to make the experience with GitHub easier for everyone: beginners, traductors, every contributor is welcomed. If you have questions, ideas for improvement, let’s talk about it and never forget that we ❤ you!